William & Mary second baseman Sean McDermott dove for Randy Bednar’s ground ball up the middle and threw toward first as the Terps’ freshman sprinted up the line. 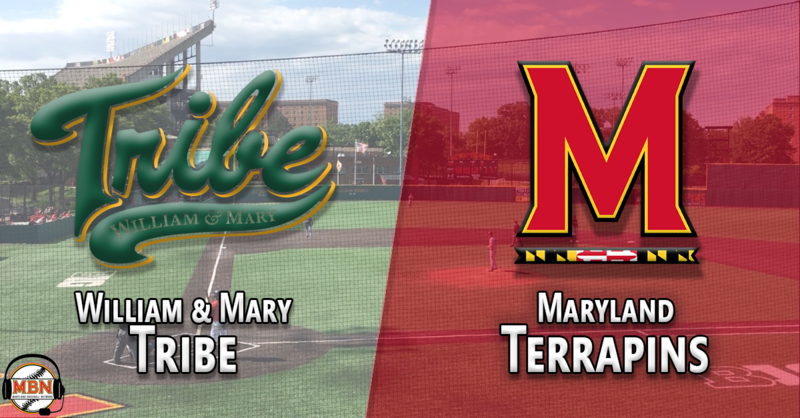 First baseman Colin Lipke corralled McDermott’s low throw to retire Bednar and the Terps, as Maryland fell to the Tribe 6-3 in 11 innings Tuesday in College Park. Taking over for Kevin Biondic on the mound in the 11th with the game tied at 3, Elliot Zoellner, aka “Fuzz,” hit two of the first three hitters he faced, putting runners on the corners for the Tribe (11-18). After a well-placed sac bunt attempt loaded the bases, Lipke poked a single through the right side, breaking the tie to give William & Mary a two-run lead. Grant Burleson replaced Zoellner (1-2) and walked in a run later in the frame to put the Tribe up 6-3. Maryland (14-15) squandered golden opportunities to win the game in the eighth and ninth innings, wasting a runner on third with no out and one out, respectively. Down by three in the 11th, the Terps looked to put a rally together against Tribe closer Wade Strain. AJ Lee singled to lead off the frame and Zach Jancarski was hit by a pitch to put two on and no out with the tying run coming to the plate. But the next three hitters couldn’t progress the rally further, with Bednar’s ground out sealing the Terps’ fate. The extra-innings loss negated the best start of freshman Mark DiLuia’s young career. The right-hander, who has been hit hard in several of his outings this year, tied a career-high with six innings of work, allowing just one run on four hits and a walk while striking out six. But his Tribe counterpart was just as brilliant early on. Maryland’s offense couldn’t get anything going through four innings against Tribe right-hander Nick Butts, drawing five walks but failing to crack the hit and run columns on the scoreboard. Once Butts exited in favor of fellow right-hander Jamie Sara, however, the Terps’ bats came alive. Trailing by one, Taylor Wright ignited a Maryland rally leading off the fifth against Sara with a double down the left-field line – the first Terp hit of the afternoon. Two batters later, Nick Dunn drove Wright home with a line drive single to center, picking up his team-best 22nd RBI and tying the game at 1-1. The Terps had a chance to take the lead, after a Costes single put men on first and second with two out, but Kevin Biondic struck out on a high 3-2 fastball to end the inning. Down 2-1 in the seventh, Nick Dunn led off the inning with a double over the head of Tribe left fielder Brandon Raquet, and immediately moved up to third on a wild pitch. Marty Costes collected his second hit of the game, driving in Dunn with a single up the middle to again tie the game, this time at 2-2. Sara again shut down the Terps’ hopes of a larger rally, however, inducing two fly outs before whiffing Jancarski on a 3-2 pitch. Again down by a run in the eighth, Watson walked to lead off the frame. Wright squared to bunt, laid it down, and sprinted toward first, as William & Mary pitcher Charlie Fletcher picked up the ball and fired it wide of first down the right field line. Watson rounded third and scored easily, and Wright ended up at third on a three-base throwing error as the Terps tied the game at 3-3 in the bottom of the eighth. With Wright at third and no out, the Terps taking the lead seemed imminent, but Richie Schiekofer and Justin Vought, the next two hitters, couldn’t drive him home. With two out in the inning, Dunn and Costes walked to load the bases, but Biondic flied out to center. Looking to walk it off, AJ Lee led off the ninth inning with a bouncing ball to third base, and while the throw to first beat the Maryland shortstop by a step, William & Mary first baseman Colin Lipke couldn’t hold on to it, and Lee was safe. After moving up on a sacrifice bunt, Lee stole third, putting the winning run in scoring position with one away, but Will Watson grounded out and Taylor Wright struck out to send the game to extras. DiLuia ran into early trouble when Tribe leadoff man Ryan Hall lined the third pitch of the game into the left-field corner for a double. He settled down and retired the next two hitters, and was one strike away from escaping the inning unscathed, but William & Mary catcher Hunter Smith dropped an RBI single in front of Marty Costes in right to put the Tribe in front, 1-0. After the early blemish, however, DiLuia settled down to give the Terps some much-needed length in a midweek start. He allowed runners on in the second and third, but was able to pitch out of jams to avoid further damage. Terps catcher Justin Vought helped his pitcher by throwing out would-be base stealers in both frames. The only marks against him in his final three innings of work were a fifth-inning error and a sixth-inning hit by pitch, neither of which the Tribe could do anything with. Mike Vasturia took over on the mound in the seventh after DiLuia’s six brilliant frames, but immediately got into a jam, walking and hitting the first two batters he faced, respectively. After a pop up, Zach Pearson, William & Mary’s leading hitter, lined a single back up the middle to score Owen Socher from second and give the Tribe a 2-1. The big right-hander was able to retire the next two hitters however to keep the Maryland deficit at one run. An inning later, after the Terps tied it up again, Tribe first baseman Colin Lipke greeted new Terps pitcher Sean Fisher with a monster solo home run that cleared the center field wall by plenty. A Hunter Smith double ushered a quick exit for Fisher in favor of John Murphy, who recorded the final two outs of the inning. Murphy fired a 1-2-3 ninth inning before handing things over to Biondic in the tenth. The two-way star allowed two William & Mary hitters to reach before retiring the Tribe in the first frame of free baseball. Maryland is back in action this weekend to host Illinois in a three-game set, starting at 6:30 p.m. on Friday.